Joni appears as The Wild Impresario’s first love in this second episode, Delighting In Sounds. The Ghost of Faffner Hall, a series that celebrates and explores all forms of music and encourages viewers to do the same, created for and premiered on HBO in 1989. I saw this back when it first aired in 1989. I was already a fan but this song blew me away! At the time I didn't know it wasn't on an album yet. I wanted to hear it again and went searching for every one of Joni's albums. 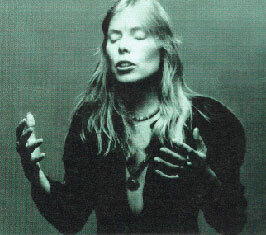 I even asked several musicians who were fans of Joni, just in case I missed an album, but they just looked at me funny. haha And in the process I became an even greater fan of Joni's music.